Latvian PM Krisjanis Karins speaks in Riga, Latvia, on Jan. 23, 2019, as new center-right coalition government is approved.Janis/Press Association. All rights reserved. 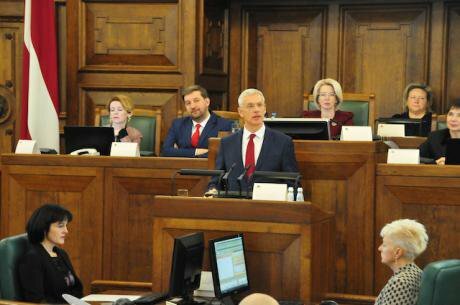 After a long string of negotiations, since the parliamentary elections of October 2018, a new coalition government was formed in Latvia (January 23, 2019). The new and rather heterogeneous government comprises three conservative/liberal parties of the centre-right (New Unity, New Conservatives and Development/For! ), one national conservative party (National Alliance/NA) and most deputies from the populist Who Owns the State?/KPV party. This piece concentrates on the persistence of the cordon sanitaire around the, nominally centre-left, Saskaņa/Harmony party (the party that traditionally garners the bulk of the ethnic Russian vote); the weakening role of National Alliance as a partner in the governing coalition; and the rapidly emerging KPV. In contrast to, say, the ethnic Hungarian minorities across the Carpathian basin, the ethnic Russian communities of Latvia and Estonia tend to rally around parties with a civic profile (Latvia: Saskaņa/Harmony; Estonia: Eesti Keskerakond/Centre Party) instead of an explicitly ethnic one. Harmony’s appeal to ethnic Russians, as well as its calls for a foreign policy of appeasement vis-à-vis Russia, has rendered political rivals skeptical over the party’s motives and reliability. Harmony secured 19.80% of the vote and emerged as the strongest party, in its own right, in the October 2018 elections. This was also the case in the 2011 and the 2014 elections, where it garnered 28.36% and 23% of the vote respectively. Despite this successful electoral performance in a series of electoral contests, the (predominantly) Latvian parties maintain a cordon sanitaire around Harmony in a way that was once again manifest in the latest coalition government. The last few years have witnessed the emergence of an intra-party cleavage inside the ranks of Harmony. This consists, on the one hand, of a younger generation of cadres and political activists who desire Harmony’s transformation into a ‘proper’ party of the centre-left, in accordance with the contemporary trends of European Social Democracy, with a paramount stress on socioeconomic issues and social welfare. On the other hand, an older generation of cadres insists on the maintenance of Harmony’s physiognomy as a ‘quasi-ethnic’ party with a primary focus on the collective representation of Latvia’s Russophones. The repercussions of the Ukrainian crisis since 2014 generate further insecurities among the Latvian elites, as well as the country’s public, over Latvia’s geopolitical weight vis-à-vis Russia’s leverage as the ‘external homeland’ of the Russophone community. So too do the continuous accusations over Russia’s alleged endeavor to jeopardize Latvia’s security via information warfare, disinformation campaigns in the social media and even the sponsorship of separatism in the southeast region of Latgale. The sum of these insecurities has resulted in the projection of a cordon sanitaire, on the part of the (predominantly) Latvian parties, between themselves and Harmony as a party that insists on a foreign policy of appeasement towards Russia. Taking advantage of the cordon sanitaire around Harmony, NA has been accepted as a legitimate partner in three coalition governments (2011, 2014 and, most recently, 2019). Broadly fitting the profile of a national conservative party, NA has been insisting on protracting the securitization of Latvian-Russian relations and maintaining as intact the integrity of the nexus that consists of regional geopolitics (bilateral relations with Russia) and domestic ethnopolitics (the collective status of Latvia’s ethnic Russian minority). As a National Alliance representative at the Latvian Saeima (‘Assembly’) and the European parliament stated to me in an interview (October 2017): " Kremlin’s weaponization of the “Russian world” concept is visible in Latvia… the contemporary “Russian World” concept is reminiscent of the Völksdeutsche concept in the days of Nazi Germany." Throughout its participation in the halls of power, NA has in addition been promoting its policies on demographic issues and providing incentives for an increase in Latvia’s birthrate (e.g. a set of social benefits for young/single parents and families with many children); as well as spearheading its proposals for Latvia’s educational reform. The former policies channel support towards the party from the social strata in question. The latter proposals polarize public opinion and have been interpreted by ethnic Russian interest-groups as a subtle endeavor to ‘engulf’ Russian-language schooling institutions (2017-2018). The party-leadership objects to the ‘Eurosceptic’ label and, instead, contends that their chief objective is to ‘renegotiate’ the terms of Latvia’s participation in the EU via the revision of a euro-federalism doctrine which the NA regards as ‘seriously flawed’. Since 2015, the EU refugee quotas arrangement has emerged as an additional bone of contention between NA and the European Commission. As the Secretary-general of the party told me in October 2017: "If you look at the UK or France, ghettoization, crime and the spread of Islamic fundamentalism constitute an explosive blend. Latvia is and will remain safe if it manages to escape the migration waves." One of the latest Eurobarometer surveys (no. 89, Spring 2018) found out that a large percentage of Latvian citizens are worried about terrorism and other asymmetric threats in Europe. This finding correlates with NA’s systematic capitalizing on public grievances over the EU refugee quotas since the second half of 2015. Nevertheless, the same survey equally points out that a large percentage of the Latvian public remain highly vexed about social security, unemployment and the cost of living inside Latvia. These socioeconomic realities largely account for NA’s decline of popularity in the latest elections (11.01% in comparison to 16.61% in 2014) and the diversion of a considerable chunk of the vote towards a new, anti-establishment party with a powerful stress on the economy: Who Owns the State?/KPV. Under the leadership of, former actor, Artuss Kaimiņš, KPV was officially launched on May 6, 2016. Fashioning themselves as a ‘non-ideological and anti-establishment organization of political activists’, along the lines of Italy’s Five Star Movement, the party’s platform lays considerable weight on the economy including a touch of economic Euroscepticism. Conforming to the predominantly pro-EU inclinations across the party-spectrum, KPV does not promote a platform of hard Euroscepticism yet contends that EU budgetary policies cannot guarantee Latvia’s full recovery from recession; and that Latvia did not benefit from the introduction of the Euro because the cost of living has dramatically increased. Taking into account the persistent outcome of the latest recession (2009-2011), economic grievances and anxieties abound in Latvian society and KPV clearly aimed at filling in this particular vacuum in the country’s political map. KPV’s high appeal among Latvian, mostly blue-collar, immigrants in western Europe, throughout the span of its existence as a party, is indicative of the financial insecurities within society as well as the aftermath of the recession as a whole. KPV duly jumped to a percentage of 14.25% in the last parliamentary elections making it Latvia’s second largest party in its own right. The rapid emergence of KPV hints at the growing relevance of economic Euroscepticism not solely for anti-austerity initiatives in Southern Europe but also for a new generation of ambitious, anti-establishment, parties in the crisis-ridden parts of the ‘new’ Europe (e.g. the Živi Zid/Live Wall party in Croatia). A series of academic experts and political analysts have underlined the relatively high levels of fragmentation and volatility in Latvia’s party-system despite the general state of social stability. At this given moment, it is not an easy task to rush to sound predictions over the long-term prospects for the new coalition government to pull together. On the one hand, the joint endeavor to enhance Latvia’s geopolitical weight vis-à-vis Russia and resist information warfare certainly provides a common ground among all the partners, however heterogeneous. On the other hand, the management of vital areas such as the economy and social welfare are always likely to generate the kind of discord that also occurred rather recently in neighbouring Estonia (the dissolution of the previous coalition government in November 2016).